Located just outside Coshocton on the west side, Roscoe Village is really a village within a village. It has more than 20 eating and drinking establishments. Villagers can walk to shop at several charming boutiques, enjoy a delicious meal, and complement it with a stop down the block for gourmet ice cream or coffee. Roscoe Village is a restored Ohio and Erie Canal town operated by the non-profit Montgomery Foundation. It is a free, educational, and entertaining place to take your family for a summer outing. With an old time general store, a craftsman's shop, and more, you will find yourself transported from the time you step foot on the main thoroughfare to an era that has passed. Shops and gift stores are open during regular business hours. However, tickets must be purchased to enter some of the historical buildings that are open at specific times throughout the year or to participate on the guided tours available from the Visitor Center. Apple Butter Stirrin': With over 100 crafters, this invitational craft festival celebrates the sights, sounds and scents of autumn. Smell the fresh apple butter simmering over an open fire as you stroll through the street to the tunes of bluegrass and old-time music. Watch cooking demonstrations, participate in a craft auction or a hog-calling contest, sign up for a quilt raffle. Events throughout the weekend will include living history tours, canal boat rides, musical entertainment and children’s activities. Christmas Candlelightings: The first three Saturdays in December, Roscoe Village cheers on the holiday season with its Christmas Candlelighting Ceremonies. Share in the tradition of lighting the Christmas tree and participate in lighting your own candle as "Silent Night" is sung throughout the crowd. Over the weekend, guests can enjoy a visit with Santa, strolling carolers, live reindeer (first Saturday only), chestnuts roasting over an open fire, candlelight tours, complimentary hot-mulled cider and cookies and many other holiday festivities. If you visit the village, you can park on the street if you can find a spot, or there is parking at the north end of the village next to the Visitor Center. The Visitor Center has some interesting displays and even some hands on areas. There is no charge for walking through the village or going into the shops, however, there is a fee for entering the exhibit buildings. You can purchase tickets at the Visitor Center and take the guided walking tour. 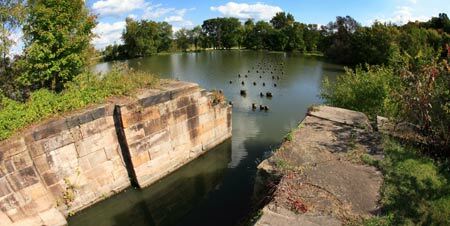 A little further out SR 36 from Roscoe Village, you'll find the remains of canal locks along with a parking area to access the locks and water basin. 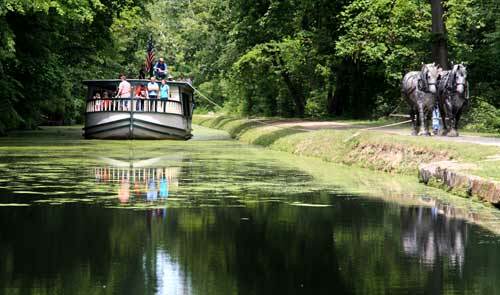 A mile or so north of Roscoe Village is a working canal boat, the Monticello III that offers historic horse drawn canal boat rides between Memorial Day and Labor Day, Tuesday thru Sunday. They are closed on Mondays. Charter rides are available April through October. A fee is charged. The dream to restore the canal town know as Roscoe Village began in the early 1960s in the minds and hearts of Edward and Frances Montgomery. Edward Montgomery grew up in nearby Coshocton and remembered the destruction of the canal system that came with the flood of 1913. In the early 1800s, Roscoe Village prospered as a port on the Ohio and Erie Canal. Canal boats traveled through Roscoe carrying goods to Ohio settlers and transporting furs and food to northern and southern ports. What stands today as the Old Warehouse Restaurant was the center of commerce as goods were unloaded, stored or sold through the mill store. The development of the railroads and the devastation that resulted from the flood signaled the end of prosperity for Roscoe Village. Mr. and Mrs. Montgomery's dream lives on through the not-for-profit corporation they created. The Roscoe Village of today provides an educational, entertaining and fun atmosphere blending with the rich history of this Ohio region. Roscoe Village is a living expression of the dedication that Edward and Frances Montgomery had for each other and for the town they called home. This unique “Village Within the City” has more than 20 eating and drinking establishments. Villagers can walk to shop at several charming boutiques, enjoy a delicious meal, and complement it with a stop down the block for gourmet ice cream or coffee. Every bit as unique as our local establishments are the people who live and work in Roscoe Village. They are committed to building a strong community through Roscoe Village Neighbors.